Discussion in 'Amps and Cabs' started by iitrebor, Oct 20, 2008. 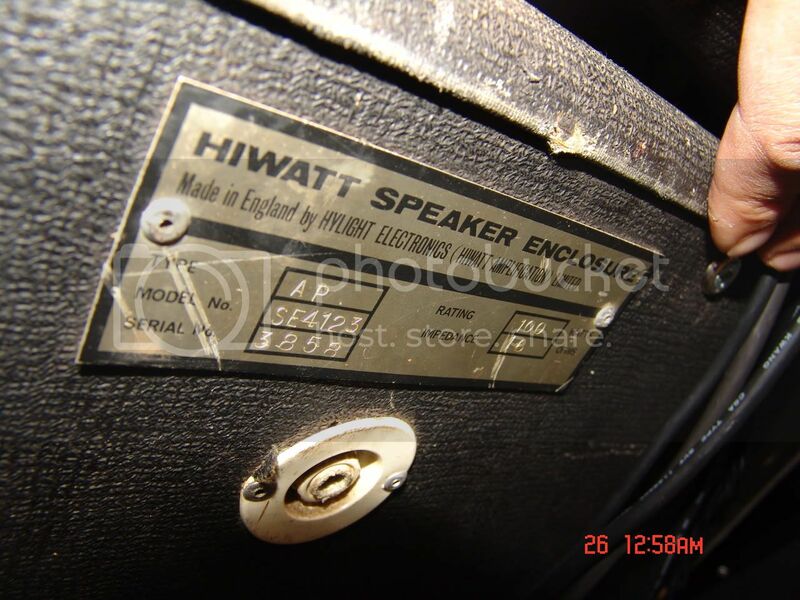 I have a 1972 Hiwatt DR504. Been looking at speakers for a while. I have an empty bogner 2x12 cab that I am looking to fill. I have been looking at the fane inspired speakers by weber and eminence, but I am not sold. I love my clean tone, as I use many pedals, particularly of the fuzzy persuasion. Perhaps some of you can sell me on the speakers I have just mentioned or point me in a different more positive direction. Check out the Vintage Purples as well. Scholz Sugar Cones are expensive.....but I understand this is the way to go. Thanks for the recommendation. Those Scholz are pricey, but seem cool. By "vintage purples" do you mean the speakers that come in the Reeves cabs? I don't think you can buy them on their own. I love my Weber Thames with my DR504s....... I run them in a Swanson 2-12 cab. Seeing as how the Hiwatt Fanes seem to be in the 50-watt range and the ceramic Weber Thames is rated at 80-watts, would a ceramic Thames still be a good match for an original Hiwatt Fane? You can have Weber make the Thames in a 50 watt version. I'm using the Weber Thames in an Avatar 212 with my Reeves Custom 50. I am very happy with the sound I am getting, although I haven't done a direct comparison with any Fanes. Thanks Tripower455 and Tinman. Tinman, are you using the ceramic Thames? In addition to the regulars mentioned, check out Eminence Lynch Super V12s. They look identical in construction to Vintage Purples, and Lynch had them designed to mimic vintage Fanes, so if you do the math they're probably the same thing. And they probably get around the proprietary thing because VPs are only available in 16 ohm and LSV12s are only available in 8 ohms. My thinking exactly... Hopefully I'll be trying them out soon! Where can we find those Lynch speakers? Bump because I'd like to know where to get the lynch spkrs too. Most major retailers have them... Guitar Center and Music123 to name a couple. After much consideration, I went with the Weber Thames. I have had them for two weeks now and I am very pleased. They are great speakers. Thanks for all the feedback! I just ordered a Reeves Custom 50, an Avatar Vintage G212V, and 2 Weber Thames 80s, the ceramics, and I had a really hard time choosing between the Thames, and the FC12s, which are dead on clones of the Fane Creseando's that Gilmour has always used with his HIWATTS, but CJ at Weber said he prefers the Thames, and runs them himself, so that pretty much sealed it for me. However, Weber will build the Thames in a 50 watt version, which should be the exact same speaker as an early '70s HIWATT stock Fane. I have heard from many HIWATT, REEVES owners that they can't live without their ceramic Thames 80's, and when the builder tells me to get a less expensive product, because it sounds better for a specific application, that's enough for me! 60 oz mags, and 2" voice coils, I think they should sound like Heaven! That's my $224 worth!